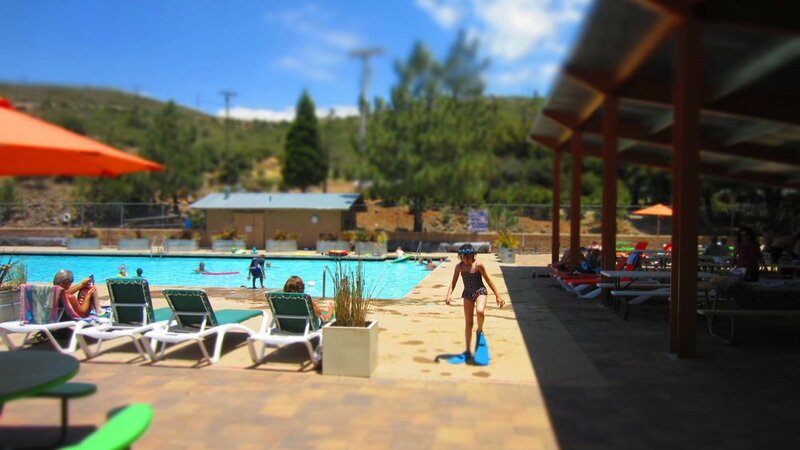 Pinecrest Retreat has a recently renovated, solar heated, centrally located, Jr Olympic-size swimming pool. There is a snack shop offering a variety of tasty treats. Summer events such as Bingo, movie night and live music take place around the pool. Come check it out this Summer. The Pool is open for the Season Memorial Day Weekend through the end of September. Day Use passes ARE NOT AVAILABLE. Pool access is included with all overnight accommodations. The Pool is closed on Tuesdays for cleaning. The Pool has Adult and All-Swim Hours; check table below for information. Swim Club memberships are available to the local Julian community. Monthly or season memberships (four month) can be purchased for a single, couple, or family up to six people. Our Swim Club begins the Wednesday after Memorial Day weekend and ends late September. Click here to view the Swim Club Membership Application.